— To increase the frequency (and volume!) of our message by turning our Website, our Forum and our Newsletter – RACIAL LOYALTY, into informative, printable publications for use in both online and offline dissemination. This I consider to be the matter of Top Priority No. 1: Its success is a prerequisite for our success in all the other projects. To achieve this very important goal, we need more submissions for our Website, Forum and Newsletter from the activists in the field. Also our present resources at the Global and various National Offices do not permit us to increase our staff. Therefore each Creator must feel a sacred duty to support the Global Office of the Creativity Alliance with regular and generous financial contributions to be sent through the Office of their National Coordinator. 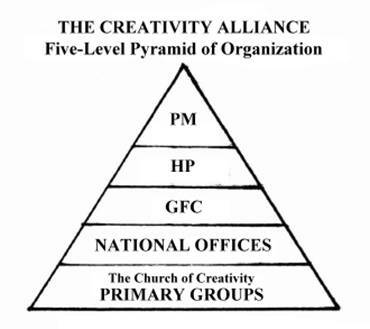 — To assure organizational continuity of a strong central leadership of the Creativity Alliance by organizing the Church leadership in accordance with the FIVE-STEP PYRAMID PRINCIPLE as follows: PONTIFEX MAXIMUS, CHURCH ADMINISTRATOR / HASTA PRIMUS, GFC, NATIONAL OFFICES and CHURCH PRIMARY GROUPS. Also, we should institute annual Membership Congresses and Activist Leadership Conferences, as well as expand our Youth activities. — Requires (a) More Creators to step up and register as PG CONTACT POINTS; (b) The creation of more local Church web sites and blogs; (c) A dedicated group of individuals to form an INTERNET BLITZ TEAM, with the task of making a coordinated concerted effort to blitz any targeted social networks and forums on the internet with messages promoting our Religious Creed – And then just as quickly move on to another target. In preparation for the OPERATION “STREET ACTION, we must: (a) Arm our Logo, Flag and Masthead with our rallying SOUND BITE: “WHITE PEOPLE AWAKE! SAVE THE WHITE RACE!” (b) Adopt the WHITE HAT/WHITE CAP/WHITE BERET UNIFORM; (c) Obtain and carry with us at all times the concentrated essence of our ideas in an easy-to-carry, pocket-size eclectic compendium – THE LITTLE WHITE BOOK. — To contact, attract and organize under the victorious flag of the one and only White Racial Religion, CREATIVITY, all White youth. In order to appeal to our youth, we must take at least the following steps: (a) Revitalize the CREATOR KIDS’ web site; (b) Create a youth section for the Newsletter, which could be titled “CREATOR YOUTH – YOUNG WHITE WARRIORS”; (b) Put all known White youth and kids’ organizations and individuals on our mailing list; (c) Organize youth leadership seminars and youth camps; (d) Organize frequent and systematic STREET ACTIONS (leafleting, wall and sidewalk slogan painting, etc.) on college and high school campuses. – Under the guidance of the appointed Imperator of Prisons, contact and provide moral and material-help to jailed White activists. — To contact and attract into our ranks large numbers of White Ethnics, various culturally distinct Europeans – European-Americans, European-Australians, European-Africans – by issuing direct appeals to them and organizing White Ethnic Sections of the Creativity Alliance. White Ethnic Sections could concentrate on: (a) spreading our word in their communities, (b) translating our works into their own languages, and (c) helping to spread our ideas in their “old countries” in Europe. — To organize active branches of the Creativity Alliance in ALL White countries, especially in major European countries, the United States and Canada, South Africa and Australia. Obviously, the success of our OPERATION ‘WHITE ETHNIC” could greatly facilitate (through translations and pre-established contacts) the spread of our ideas across the world and thereby help our OPERATION “GLOBAL”. Each Creator must realize that his personal dedication and commitment to the Sacred Cause of the One and Only White Racial Religion is the key factor in winning the worldwide Racial Holy War and assuring the survival, expansion and advancement of our precious White Race. For increased dedication and commitment, let’s read the sacred books of Creativity on a daily basis. They are the best books ever written in the 6000 years of White civilization. WE BELIEVE that the White Race is Nature’s Finest. WE BELIEVE that the one and only, true and revolutionary White Racial Religion – Creativity – is the only salvation for the White Race. “To the fulfillment of these religious beliefs, We Creators forever pledge our Lives, our Sacred Honor, and our Religious Zeal.